Authorized by the IFSC of Belize, JustForex offers a “50%, 75%, or 100% Holiday Deposit Bonus” to all its clients upon making at least $50 deposit from 19th of December to 31st of January, 2018. Every client has the opportunity to receive up to $20000 bonus for trading and making a profit. Register now and earn as much profit as you can! The Mini Account holders are required to make a $50 deposit (or more), and for those with Standard Accounts, the deposit amount starts from $100. Moreover, the clients with one trading account can receive up to $10000 bonus, and the bonus amount goes as high as $20000 for those with several trading accounts. The traders will have 90 days to use the bonus for trading. After meeting the required conditions, the profits will be transferred to your account within 2 hours. Upon canceling the bonus, you can also withdraw the deposited amount. 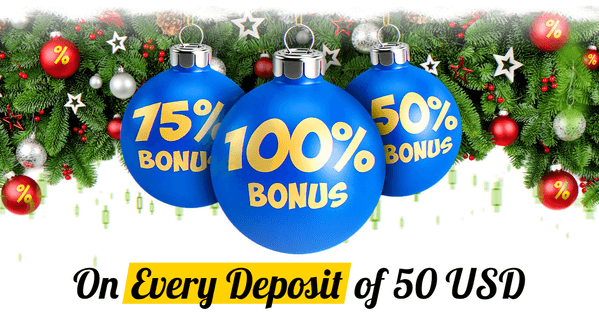 You’re required to fund your account with no less than 50$, apply for the “Holiday Deposit Bonus” on the website promotion page - the deposit amount that suits you best - and start trading. The bonus amount is for trading only; however, the deposited amount, as well as the earned profits, are yours to withdraw after fulfilling the required conditions. The deposit should be made via one transaction. The clients who choose the Payment Agent for depositing should notify the JustForex Support Team. The internal transfers don’t count as a deposit. Premature orders (before the promotion) or those with less than 3 pips are not included in the final calculation. In the case of equity being equal or less than the credit, the bonus will be annulled. Get JustForex Holiday Bonus Now!